Portal 2 is a very popular game among the geek/nerd/tech community because it actually makes us use our brains. You don’t just go around shooting zombies or fighting dragons, but you have to test your brain power and be a wizard at problem solving. 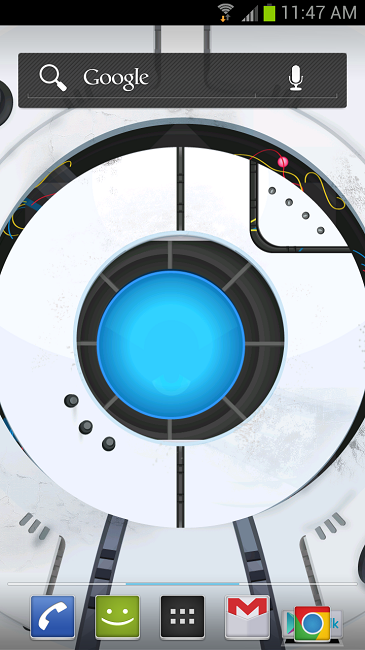 Everyone’s favorite character, Wheatley now makes his debut on Android as an awesome live wallpaper. What makes him even more stellar on Android is that his eye follows your finger’s movements across the display and blinks when you tap on him. But alas, if only he could deliver his fantastic sense of humor as well to us in this form. The wallpaper is only a $1 and is quite worth the buck.